GOBankingRates analyzed how many houses you can buy in cities around the country compared with the price of one house in some of California’s biggest cities. 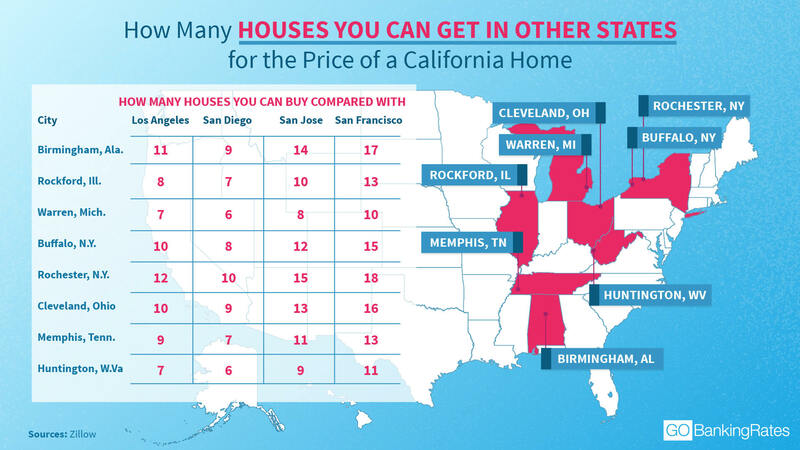 In some other cities, you can buy as many as 18 homes compared with one California house. Two New York cities made the list of the top 10 cities where you can buy the most houses. California is an expensive place to live. As a Denver native who also spent some time in Portland, Ore., I’ve had a chance to live in several housing markets, but neither Denver nor Portland put on the money pressure like good old California. A recent study by GOBankingRates found that the price tag of one home in California can buy you multiple homes in other places around the nation. Let’s take a look at just how expensive it is to live here in California — and how I’m surviving in this expensive housing market. How Many Houses Can I Buy Elsewhere? I live in Ventura, midway between Santa Barbara and Los Angeles. The median price of a home in Los Angeles is $795,000 as of April 2018. That is a big enough cost to afford 11 homes in Birmingham, Ala.; 10 homes in Buffalo, N.Y.; six homes in Milwaukee; three homes in Minneapolis; two homes in Miami or one home in Honolulu — with cash left over. This might make it seem crazy to live in California. My wife and I picked our city to be close to family and because we love the amazing weather and lifestyle (and avocados). But we have to work hard to make it affordable. The biggest key to my success in California is savings. Before moving to California, I owned a condo in Denver and a house in Portland. I did very well on those two properties thanks to the hot real estate markets in those areas, and combining my savings with my wife’s made both the Portland house and my home in Ventura possible. Most experts suggest saving at least 20 percent for a down payment to buy a home. At that rate, there is no way I would have been approved for a mortgage, even with my $10,000+ per month income, with the resulting monthly payment. My wife and I put down over 50 percent of our home’s sale price to make the monthly payments work. Like much of personal finance, saving a six-figure down payment is easier said than done. Starting with a less expensive home and upgrading a couple of times helped, as did an aggressive savings rate to build up our down payment fund as quickly as possible. Between property taxes and income taxes, I estimate I could save about $20,000 per year moving next door to Nevada, which has no state income tax. But then I would have to live in a hot desert with scorpions. No, thank you. With property taxes, home insurance and earthquake insurance, we pay about $15,000 per year. We don’t use an escrow account, so that means I have to stash away a little over $1,000 per month to avoid the pain of those big payments. It isn’t all doom and gloom here in California, despite the many earthquakes, alien invasions and other disasters depicted by Hollywood. We actually get quite a bit back for our taxes here in California. For example, being self-employed in any other state, it would be important for me to buy disability insurance. But here in California, that is included in my state taxes. That’s about $5,000 per year I save. Sure, that is far from making up for the cost of my house, but every little bit helps. Although Frank Sinatra said, “If I can make it there, I’ll make it anywhere” about New York, the same is true in expensive California. If you can afford it here, you can afford it just about anywhere else. But with the right focus on your finances, anything is possible. Click through to read more about the most and least affordable states to buy a home if you’re a millennial. Chicago's housing market is showing signs of trouble.